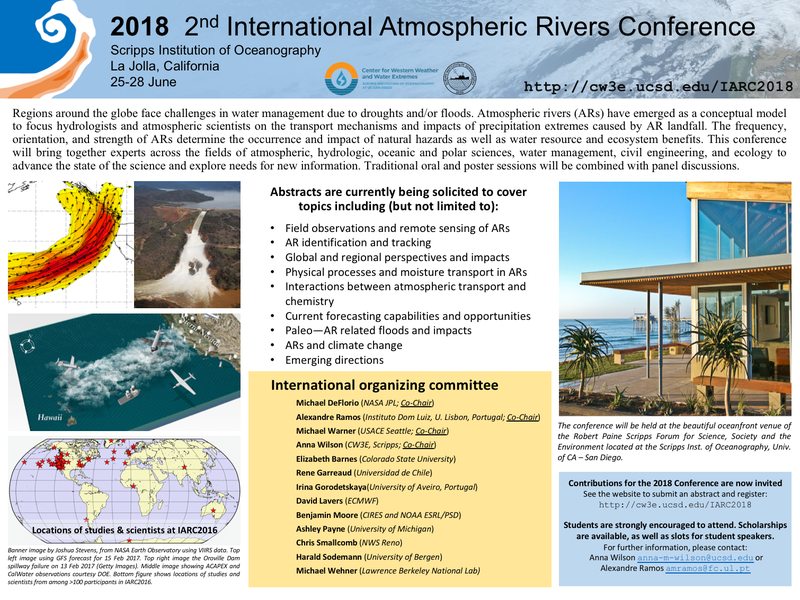 The Center for Western Weather and Water Extremes (CW3E), at the Scripps Institution of Oceanography (SIO), UC San Diego, is hosting the 2nd International Atmospheric Rivers Conference (IARC) from June 25-28, 2018. Ths conference is organized by an international committee, with co-chairs from NASA’s Jet Propulsion Laboratory, the US Army Corps of Engineers, CW3E, and the University of Lisbon. The conference is located at the seaside Robert Paine Scripps Forum for Science, Society, and the Environment on SIO’s campus. Over 100 experts across multiple fields are coming together to advance the state of the science and explore needs for new information. Fifteen student scholarships were given to students coming from locations such as India, Chile, and across the U.S. There will be extensive opportunity for interaction during the conference and after. A cocktail hour and dinner, included with registration, will be provided on Tuesday, June 26. The agenda and other information can be found on the IARC website. Traditional oral and poster sessions are combined with panel discussions and breakout sessions. Sessions will be focused on various topics including: Winter 2016-2017; Airborne observations of atmospheric rivers (ARs); Subseasonal to seasonal forecasting of ARs; Applications and communications; AR Tracking; Regional perspectives on ARs; AR dynamics; AR microphysics, aerosols, and chemistry; Weather forecasting of ARs; ARs and Hydrologic Impacts; ARs and climate variability: past, present, and future; and Emerging directions. Immediately after the conference, CW3E is also sponsoring a student forecasting workshop to be held June 29-30, with exercises planned on decision maker communication and forecasting for airborne field campaigns. Students will also be able to tour the National Weather Service San Diego offices and participate in a demonstration radiosonde launch from the Scripps Pier.